Let me just start by saying - this outfit is neutral PERFECTION. Seriously, I can't get enough! This sweater has been a favorite of mine for months (after I purchased it in like 3 different colors) and I was so happy when it came out in taupe. It can also be worn off the shoulder, which I love, but it was too chilly in Newport to rock that look. On another note, I can't stop wearing these jeans! I'm obsessed with everything from the fit and distressing to the raw hem and perfect shade of white. If I could only purchase ONE spring/summer staple piece for my closet, this would be it. And last, but definitely not least, can we talk about these tassel mules?! Dead. Just dead. I wore this look while we were mansion hopping on Bellevue in Newport over the weekend and it was perfect. Lightweight enough for the 65 degree weather, but comfortable and chic at the same time! Spot on combo! You're looking so cool in this outfit! 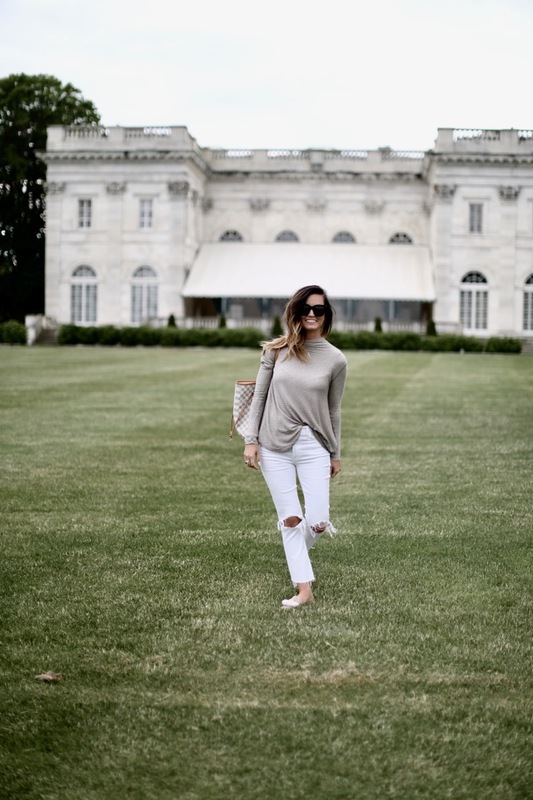 Such a great neutral look! I love that sweater! Love everything with this look! Perfection indeed!